Have been in use in Europe and Asia for over 20 years. They are just starting to gain wider acceptance and use in the United States. Tank-less water heaters are more energy efficient than traditional tanks because they heat water as it is used, rather than heating and re-heating water in a storage tank. They are also common in Europe and Japan in large part because they take significantly less physical space. Years ago it was simple: Replace your hot water heater with one of the same. Today, however, there are many options to consider as most people are looking for energy efficiency or green hot water heaters for their home or business. Call for a free, over the phone estimate today. • How well your existing unit hold up, did it do the job ? The two main advantages of a Tank-Less water heater is space and endless hot water. In some older homes, the existing water heater is located in a hall closet. Today, most customers are opting to install a Tank-Less hot water heater in it’s place and make room for storage in the closet. As you can see from the picture, you end up with a lot more space. Don’t let the size fool you, these water heaters never run out of hot water. 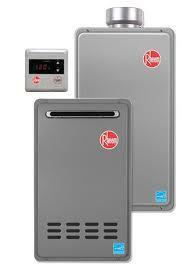 You also save money because your not heating water that sits in a tank like most traditional hot water heaters. If your budget allows for a tank-less water heater, take advantage of all they have to offer. Most cities now offer rebate incentives or fed tax credits for tank-less much like solar hot water heaters. You will need to fill out paperwork once we install your new Tank-Less hot water heater. You can do this on-line in most cities. We service and install all makes and models of Tank-Less hot water heaters. We do have our favorite brand and the only reason is if the heater needs service, we can get parts and support the same day. There are a few brands we have installed in the past and when it came time to repair the Tank-less heater, we had to wait a few day for the parts from the manufacturer. 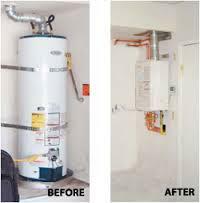 We no longer install those tank-less hot water heaters but we do repair them. Call today and we will recommend the right Tank-Less water heater for you and your needs.